"Un enregistrement tout empreint de charme et de simplicité. Les courtes mélodies modales sont irrésistibles... produisant ... un effet incantatoire..."
"It is a recording of immense charm and simplicity. The short modal melodies are compelling, even after the constant repetition of multiple stanzas. The effect of these on the ear is rather like an incantation and as two of these tunes occupy more than a third of the entire recording one might expect the result to be monotonous. Quite the contrary: some variety is introduced by the use of canon or discreet accompaniment, but the melodies themselves (Muito faz grand'erro and De toda chaga ben pode guarir) can bear this constant repetition." This commentary is a continuation of an article entitled "Cantiguas" published in Goldberg (no. 1). 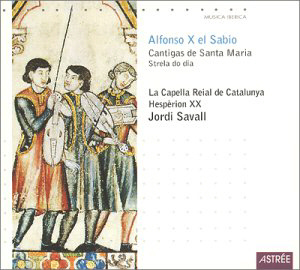 "Savall is always Savall, whatever the repertoire. His inclination towards the hedonistic, the luxuriant, and the dazzling array of colours and rythms, always maintain the force of irrepressible seduction. His Cantiguas are the exact opposite of those of Sequentia (Deutsche Harmonia Mundi 054722 77173 2 - 1991). You will find here no precise historical reference, no contrast in inspiration. They are all cast in the same mould, as though the codex followed only one form. Indeed, both the vocal style and the instrumental realizations carry the anachronistic stamp of a vaguely orientalizaing Hispanic renaissance or pre-baroque, devilishly attractive but cautious. 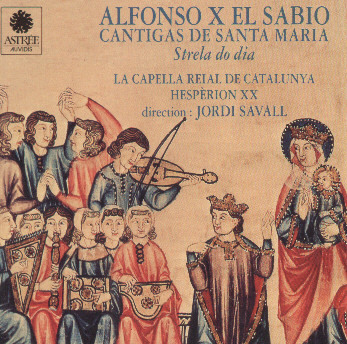 What is the reality of the world which Savall evokes ? That of Sequentia, more demanding, seem also to be the truest". Jesus Martín Galán conclue son article en s'interrogeant sur les motifs "... qui poussèrent le roi sage à rassembler systématiquement des chansons en l'honneur de la Vierge..." Il répond en nous rappelant que ce recueil a été constitué "à un moment où la poésie troubadouresque est complètement associée à l'idée de l'amour courtois (et que par conséquent) faire d'Alphonse X le Sage la figure d'un troubadour qui chante sa dame idéalisée, la Vierge Marie en personne, n'est pas du tout une idée erronée... Le concept divinisé de la femme dans la poésie médiévale¹ a pu donner lieu à l'apparition de cette littérature mariale... De ce point de vue, la collection suppose fondamentalement la sacralisation du fin'amor ou, pour citer Ismeal Fernández de la Cuesta, le transfert au divin de l'attitude troubadouresque"
Jesus Martín Galán concludes his article by questionning the "... motivations of the wise king to undertake the task of systematically assembling songs in honour of the Virgin..." He answers by reminding us that the collection was assembled "at a time when poetry of the troubadours was completely associated with the idea of "courtly love", (and consequently)it must not have been thought at all strange to see Alfonso X, the Wise as a troubadour singing to his ideal lady, who is none other than the Virgin Mary... The exalted concept of woman in Provençal poetry could have brought about the appearance of this type of Marian literature... Seen in this light, the collection essentially implies giving a sacred character to the fin'amor, or, to quote (Ismeal) Fernández de la Cuesta, the transference of the troubadour attitude to the divine"
Adaptation: "Classic @ la Carte"
Excellent article with a comparative discography.